Rodeo Empire can provide Rodeo Bull, Surf Simulator or Ultimate Wipeout with friendly and professional staff throughout the North West. 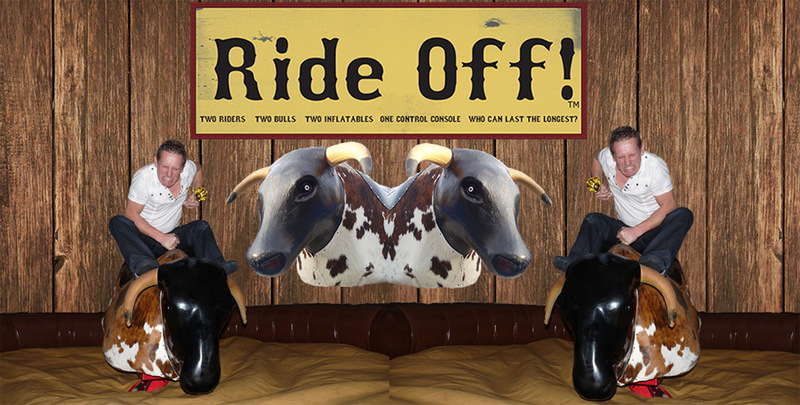 The Rodeo Bull comes with a western theme style inflatable mattress, life size Bull with real cow hide and flashing eyes. 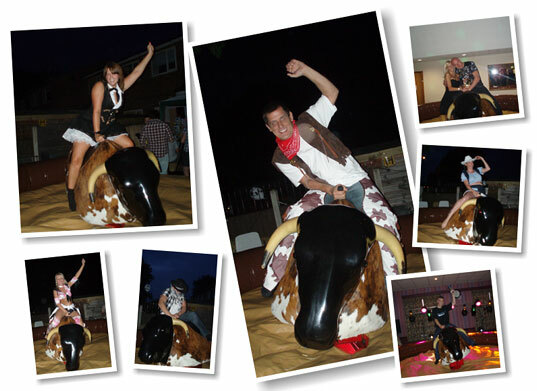 Book now for all your party needs including: For Rodeo Bull hire in Greater Manchester and the North West, contact Rodeo Empire . Our drivers will deliver to anywhere in the North West of the UK, providing your party with the ultimate in Rodeo Bull Hire or Rodeo Bull event. All the units from Rodeo Empire are clean and replaced on a regular basis. We are proud to have held bookings with major clients such as Manchester City Council, Mercedes Benz, Total Fitness, Manchester United Football Club and many other major events. 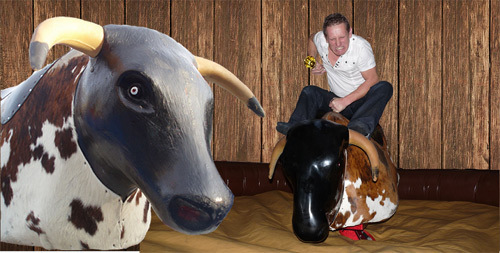 For all of your Rodeo Bull hire needs in Manchester and the North West , contact Rodeo Empire Castle Hire today. You can book online or via phone. When you book online no deposit is required and you can cancel the event of bad weather with no penalty. The Rodeo Bull also known as a Bucking Bronco. Hold on tight and try your best to tame the beast before being ejected. The Rodeo Bull is so popular we have three in our farm. Should one Rodeo Bull not be enough you can hire two to be operated at the same time. One controller with two units for the ultimate Ride-off experience. Ride the waves with the Surf Simulator. Test your balance as we imitate the waves of the open ocean. 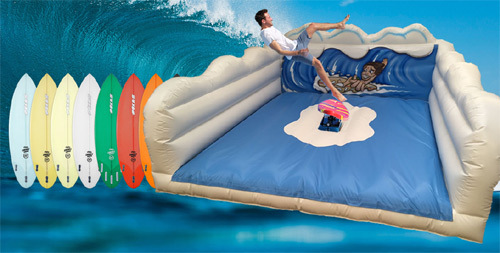 You will feel like a real surfer without getting soaked. 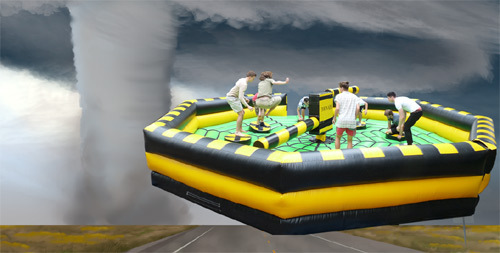 Tackle our Rodeo Football as it will spin and tilt you into defeat. 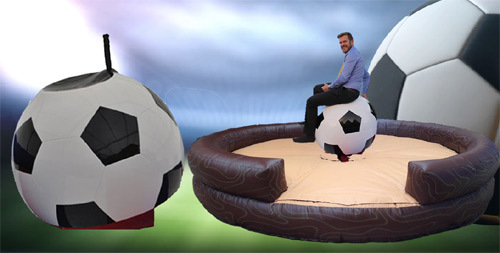 Football presentation nights will never be the same with this entertainment simulator. 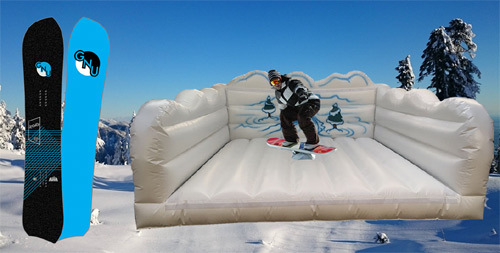 Test your balace with the Snowboard Simulator. The simulator will tilt and rock you off the board. Tornado also known as Ultimate Wipeout or Last person standing. Up to eight players will battle against the rotating arms to duck and jump. Once wiped out the contender is eliminated until one person is declared the winner. 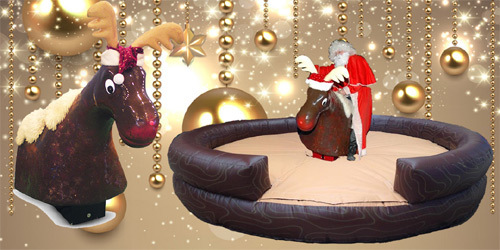 Our Red Nose Bucking Reindeer will give everyone the Christmas spirit as you buck and spin until defeat. Christmas parties will never be the same. 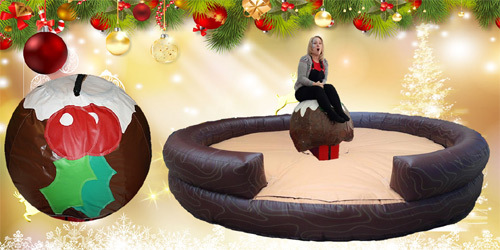 The Rodeo Christmas Pudding will spin and tilt you into defeat. Perfect for those Christmas parties young or old. Perfect for Hen Parties, Student Nights, Anne Summers Parties, Nightclubs and all other adult related events. Hold on to his privates while you are taken on the ride of your life. The male mannequin is fun to watch or ride. Perfect for Stag Parties, Student Freshers, Nightclubs and many other adult related events. You will be required to hold on tight to the female mannequin’s waste before being ejected from the simulator.The female mannequin can be enjoyable to watch or ride.